Situated at the heart of the English Riviera on the south Devon coastline, Torquay is a stylish resort with a palm-fringed promenade, seafront gardens and a lively harbour. 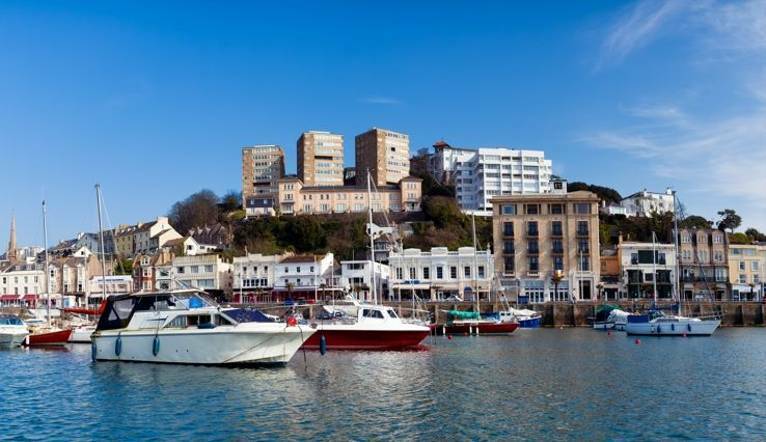 Torquay has something for everyone with an abundance of eateries, bars, shops and attractions. Join us for a wonderful day trip on the scenic Paignton and Dartmouth Steam Railway, plus a cruise along the River Dart. There is time for us to explore Dartmouth, where ancient narrow streets house boutique shops, galleries and delicatessens. The following day, we take a stroll to visit the quaint 15th-century village of Cockington with its manor house, forge and working craft studios. This was the first holiday I spent with a Solos group and it wont be the last. I enjoyed the company, we all got on so well and the Tour Leader Sue was superb. Thank you Solos! The holiday itinerary was good and I met some very nice people. This elegant hotel occupies a prime location on the seafront with Torquay station just a few minutes’ walk away. Modern day facilities are combined with the opulence and grandeur of bygone times. The leisure suite offers an indoor swimming pool, Jacuzzi, sauna and gym. Rooms are equipped with a hairdryer, a safe, TV and tea/coffee-making facilities. Complimentary car parking is available. The hotel is located in Torquay’s seafront, with Torquay Station just a minute’s walk away. Free car parking is offered on-site. Paignton & Dartmouth Steam Railway trip and cruise on the River Dart. The dress code for during the day is casual. In the evenings the dress code is smart with gentlemen requested to wear a shirt and tie. Comfortable shoes for walking and sightseeing are recommended. Remember your swimwear should you wish to take advantage of the hotel’s leisure facilities.